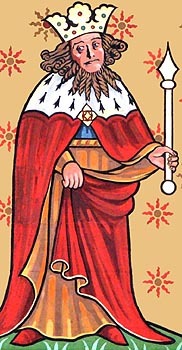 Edred was the second son of King Edward the Elder by his third wife, Edgith. Despite suffering from an unidentified illness which eventually killed him, he succeeded to the English throne in AD 946 after the unexpected murder of his brother, Edmund the Magnificent. Initially, Edred received oaths of allegiance from the men of the North at Tanshelf; but, before the end of AD 947, they had taken on the Norseman, Eric Bloodaxe, as their king. Edred hit back the following year, leading an army to Ripon and burning the minster. Whilst he was in retreat, the Northerners attacked, forcing him to threaten to lay waste to their kingdom. King Eric’s people abandoned him and climbed back under King Edred’s wing. However, the united kingdom did not last long. In late AD 950, the Northerners were in revolt again, calling back Olaf Sihtricsson to lead them. Two years later, they rejected him in favour of Eric once more; but he only lasted until AD 954, when the North finally recognized Edred as their monarch. The Norse monarchy of York was never to return. Edred helped move the monastic reform movement forward by appointing St. Aethelwold to the Abbacy of Abingdon. Aethelwold’s friend, St. Dunstan was one of the King’s chief advisors and Edred delegated much of his authority to him in his latter years. The King witnessed under a third of Royal charters issued between AD 953 and 955. He died unmarried on 23rd November in the latter year, and was buried at the Old Minster in Winchester, despite his wishes to the contrary.